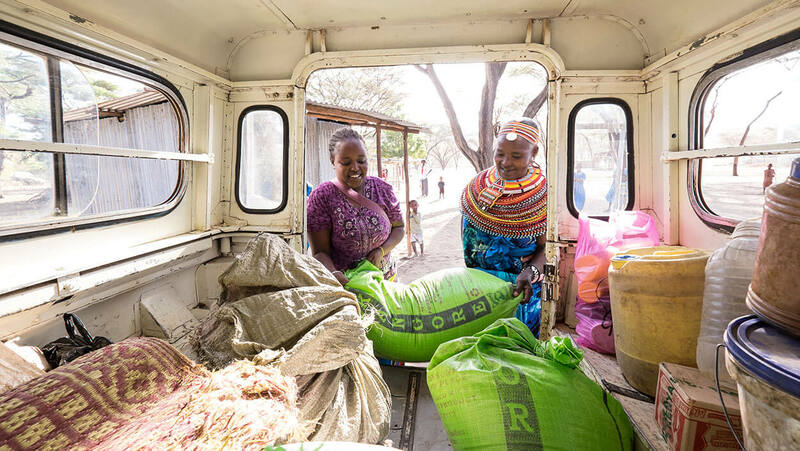 The BOMA Project’s Rural Entrepreneur Access Project (REAP) is a gender-focused model built on a globally validated proof of concept. REAP helps pastoral families by mapping the barriers to overcoming extreme poverty and then implementing a series of sequenced interventions with a defined exit strategy. To date, we have reached more than 137,000 women and children. Qualified participants are identified through a three-pronged approach that includes community consultation, ranking via BOMA’s unique targeting tool, and baseline surveys conducted by trained, independent enumerators. Each business receives a seed capital grant of $200 to launch the enterprise. A second performance-based conditional cash transfer of $100 is distributed at six months, following a satisfactory progress report by the Mentor. Mentors provide training and coaching throughout the program. Financial training sessions cover supply and demand, profit and pricing, record keeping, marketing, savings, borrowing lending, planning for long-term expenses, investing, and sustaining the business and savings group after REAP. Life-skills sessions include household decision-making, the importance of educating children (especially girls), family planning, and the rights of women under the Kenyan constitution. A BOMA Mentor assembles business groups of three qualified women and helps them launch their businesses, then visits each business monthly to provide ongoing support. At six months, Mentors assemble 3-5 business groups into savings associations, whose members meet monthly to deposit or withdraw savings. Mentors work with each group and deliver micro-trainings for the remaining 18 months. All BOMA savings groups are registered with County Social Services, facilitating their ability to open a bank account and access formal financial institutions and services. Depending on access, BOMA also helps participants open personal bank accounts. All BOMA participants are now provided with a mobile phone and subsequently connected to M-PESA, a mobile money-transfer service. No child going to bed hungry in the last month. Household members eat two meals a day in the past week. Value of business is 125% higher than total conditional cash transfer. Participant can access more than one source of income. Participant is a member of a saving group (with formal constitution and credit and loan protocols), has access to credit, and has a minimum of KES 8000 in savings. All eligible girl children are attending primary school. BOMA’S ultimate goal is not just to have an impact; it is to achieve true systems change by embedding the resilience-building approach into social protection and humanitarian systems. The devastating cycle of crisis and relief response leaves recipients as passive beneficiaries rather than active agents of their own self-sufficiency. To break the cycle we must transform how governments and non-governmental organizations deliver humanitarian aid and social protection programs. We collect extensive data from our participants, business groups and savings groups at set points along the program timeline, to ensure success and provide support when needed. BOMA’s model has created significant interest because of its cost-effectiveness and the data being generated around evidence of impact. We are partnering and strategizing with governments, NGOs, and research and advocacy organizations to work to incorporate our approach into social protection and humanitarian response systems. Read updates on our partnership projects in our latest Annual Report here.